The band name lets you already guess that Ewigkeit started as a black metal band. It's in fact not a real band, but a solo project by James Fogarty. After a primitive beginning, he made some projects with former KLF musicians and learned much about modern rock and electronics. 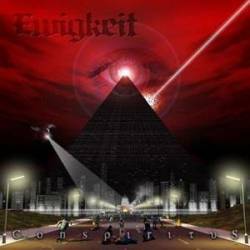 Conspiritus is already the fifth album by Ewigkeit and it's very different from what they did before. The death metal growls have completely vanished and have been replaced by regular vocals. Although Conspiritus is still a metal album, the synthesizers are the dominant element on the record. They create a spacy atmosphere on the entire album. The cover artwork underlines the concept about a world which is controlled and manipulated by multi-national corporations. The music is difficult to describe. It certainly is a kind of space rock, but definitely more aggressive and modern than Hawkwind. The mixture of rock, metal, electronica and samples shows furthermore parallels to Fear Factory, Queensrÿche and Paradise Lost. Ewigkeit also have industrial influences in their music, but they never lose their sense for superb melodies. Epic moments as on It's Not Reality and The Thought Police nearly take your breath away. And you always have to expect surprises like the harmonica on the doomish Square Sunrise. How To Conquer The World contains Deep Purplish organs and the calmer Theoreality even shows some folk roots while the ending title track is as slow as the Viking songs on a Quorthon record. Conspiritus is one of the best and most refreshing metal albums I've been listening to for a long time. It contains so many different influences and has still created something unique and exciting.